Beards have been making a full-blown comeback for quite a while now. In the dens of hipsterdom, one can hardly throw a PBR without hitting a waxed mustache. With the growing popularity of full, masculine facial hair, just growing the beard isn’t enough. Man-sculpting has been gaining traction as well. That beard needs to be properly groomed and maintained to keep you looking and feeling your best. With the rise in popularity of this trend, it’s no surprise that a slew of companies is rolling out products aimed specifically for beards at a breakneck pace. With a heavily saturated beard loving market out there, we’re here to steer you in the right direction for choosing the right product. Cremo beard balm is one of the more popular brands and in pitting it against a few others, we are here to show you why. Let’s start with the basics. A good beard style is only as good as its beard strength and beard growth. If you’re going to have a beard, you want a full beard, right? Growing a beard big and strong entails proper beard care; keeping your beard clean, conditioned and moisturized. Many have epic beards, but they just aren’t treating that beautiful hairy sculpture on their face the right way, making it look thin, scraggly and an all-around mess. Well, we’re here to tackle those beard problems with the first steps in maintaining and promoting a thick, healthy beard: the right product. Before anything else, you’re going to want to use a beard balm daily. That feeds and protects your beard the way water does with a plant. It holds in moisture making the hair follicles stronger while protecting your beard and the skin under it from the elements. What is Cremo Beard Balm? 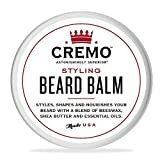 Cremo beard balm is a moisturizing styling agent meant for longer, fuller, and coarser beard types. Numerous essential oils along with shea butter may start out a bit greasier when being applied to your facial hair, yet are readily absorbed and provide fantastic conditioning. The spearmint oil contained in this product gives off a fresh minty smell that may seem a bit strong upon first applying, yet slowly and subtly fades to a pleasant afterthought. 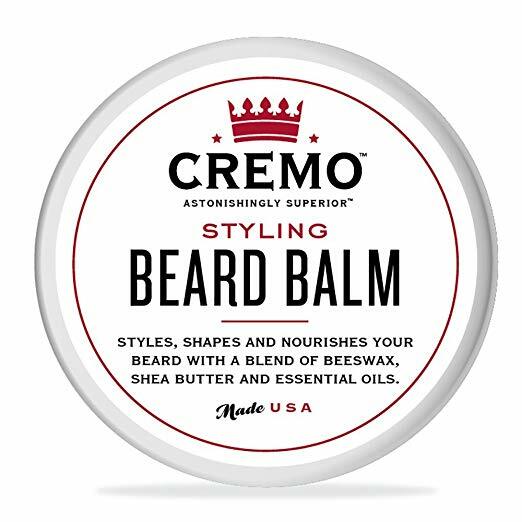 Although touted as a styling product for your facial hair, if you’re looking for more overall control, you’ll need to reapply Cremo beard balm throughout the day. In a nutshell, Cremo beard balm is easy to use, absorbs quickly, and leaves your beard feeling fresh and moisturized. Sold mainly in 2oz containers, there are 4oz available on the market as well. Cremo boasts an all-natural list of ingredients containing 8 essential oils, beeswax, shea butter and more. Beeswax is the perfect ingredient to ensure long-term beard growth, fight against itch and dandruff, and maintain flyaway hairs. Shea butter is a natural beard softener that not only stimulates beard growth but also ensures your hair is properly groomed. Vitamin E softens your hair and increases blood flow, helping healthy beard growth. Rosemary extract also boosts hair growth and the overall health of your beard and the skin underneath, acting as a moisturizer and protector. The full list of ingredients includes beeswax, shea butter, vitamin E, rosemary extract, and 8 essential oils including sunflower, jojoba, avocado, argon, coconut, lemon peel, lavender, and spearmint. The spearmint oil, of course, is what leaves you with that fresh, minty feeling. 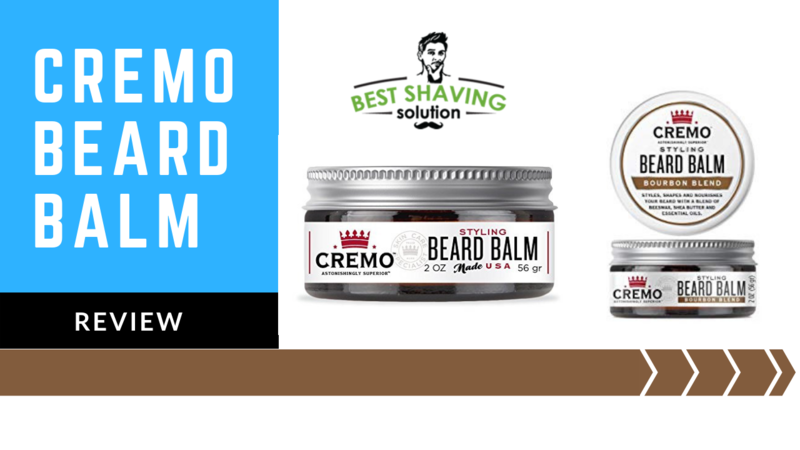 Mainly available in 2oz containers like most similar products, Cremo beard balm falls in a price range of under or around $12 at most retailers whether online or in store. Beard balms of similar size vary in the price range from $5 to $30. This is all dependent on the sizes available, quality of ingredients, brand name, and product packaging. So just because a certain product is more costly doesn’t guarantee it’s of higher quality. Cremo appears to be of a good price value for the quality of the product. Since the market for beard-styling products has become so saturated with an immense variety to choose from, we feel it’s best to do a little side-by-side comparison. Not one product is suitable for every need and comparison shopping is a great way to save yourself on too much trial and error. We’ll be pitting Cremo beard balm alongside three other contenders: The Gentlemen’s Premium Sandalwood Beard Balm, Mountaineer Magic Beard Balm, and Bear Balm – Rocky Mountain Barber. Price: On a scale of 1 to 3 $, Cremo falls under $$.Size: Cremo comes in 2 to 4 oz sizes, giving it 5 Stars.Hold: Since it requires a reapplication for maximum styling benefit, it falls to 3.5 Stars.Conditioning: With it’s 8 essential oils and shea butter’s fantastic moisturizing attributes, a solid 5 Stars.Scent: Starting with a powerful aroma of peppermint that eventually fades into a subtle scent, we give 3.5 Stars. The Gentlemen’s Premium is a recent addition into the world of beard products, yet despite that seems to be getting much attention. This beard balm is another good choice for nourishing and moisturizing a coarse beard. Shea butter, chamomile flower extract, and sandalwood oil are the key ingredients for smoothing your beard but seems to fall short on style and hold. A mild scent of sandalwood gives it a rich, woody appeal, making it one of their best sellers. Lacks beeswax, yet contains vitamin E for promoting healthy beard growth. The full ingredient list includes shea butter and the following oils: coconut, sunflower seed, argan, evening primrose seed, jojoba seed, chamomile flower extract, and sandalwood oil. Available in the 2oz size runs along the line of around $20. Size: Gentlemen’s Premium comes in a 2oz size, giving it 4 Stars.Hold: Falls short in the styling department, lacking beeswax, falling to 3 Stars.Conditioning: Has excellent moisturizing qualities with quality ingredients, giving it 5 Stars.Scent: The sandalwood oil contributes to the scent of this product and is quite mild and depending on your preference, makes it 4 Stars. A blend of vitamin E oil, butter, and beeswax make up this light pine tar-scented beard balm. For those that hate floral fragrances, this product boasts a masculine citrusy aroma with a blend of fir and cedar reminiscent of the West Virginia mountains. What stands out in Mountaineer Magic is the pine tar which combats beard flaking, dandruff, and dry skin. The ingredients listed in Mountaineer Magic are shea butter, cocoa butter, beeswax, vitamin E, and the following oils: grapeseed, almond, coconut, lime, fir needle, grapefruit, and pine tar. Available in the 2oz container, falling around a $10 value. Size: Mountaineer Magic comes in a 2oz size, giving it 4 Stars.Hold: Although made with beeswax, it falls short in the styling department, falling to 3.5 Stars.Conditioning: Reduces dandruff, softens and detangles the beard, giving it 5 Stars.Scent: The masculine pine tar scent balanced with lavender and eucalyptus is mild and pleasant, giving it 5 Stars. Boasting an effective ingredient list, this beard balm made up of 8 essential oils that are highlighted by its natural cedar wood fragrance. The scent is mild that dissipates after a few hours with a light lingering on your beard. The ingredients here aren’t fancy but are locally sourced from Canada. Ingredients include shea butter, beeswax, and the following oils: coconut, argan, jojoba, grapeseed, rosemary, lavender, tea tree, lime, and cedarwood. The holding power with this product is stronger than our previous contenders while it still conditions and nourishes. Available in 2oz, the price averages around $13. 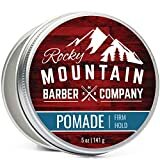 Price: $$Size: Rocky Mountain Barber is available in the 2oz size, giving it 4 Stars.Hold: This product boasts more staying, styling, and holding power than the others mentioned, making it 4.5 Stars.Conditioning: Just like all the other balms mentioned here, it has great moisturizing qualities, giving it 5 Stars.Scent: The scent is another mild masculine one, perfect for those who sport these type of beards, giving it 5 Stars. A dry beard is a weak beard. Simple as that. Facial hair is naturally dry as it is. If you don’t believe that just look at a guy who hasn’t taken care of his beard in a while. You can tell that thing’s as dry as a desert just looking at it. A dry beard is weak because when a hair shaft is dry, like most dry things, it can break. For every hair shaft that breaks and falls away, your beard gets that much thinner. Ask any woman you know, and the very mention of split ends will get you an earful of what damage it does to your hair. Enough breakage creates the dry, thin looking beards that we hate. A good beard product is the final and many times most important aspect of the beard style. Fortunately, the world of beard products is pretty simple although saturated. Keep your beard moisturized and conditioned every day, and when you want to get gussied up and feel good rocking your beard, you can keep that beard shape in place. Let that beard drink up those luxurious oils and walk around proud of your bulky beard. A good natural product can sculpt your beard into something great looking. The beards on guys that you think look good are undoubtedly groomed and kept up with. No question about it. That beard’s shape doesn’t just grow that way; it isn’t just naturally that shiny and it didn’t just grow that long without cleansing and conditioning it. What you need to be aware of (unless you want an unruly and unattractive beard) is that you must shampoo the beard, condition the beard, comb the beard, and soften it using a quality beard balm. Cremo beard balm has a potential for most beards out there. 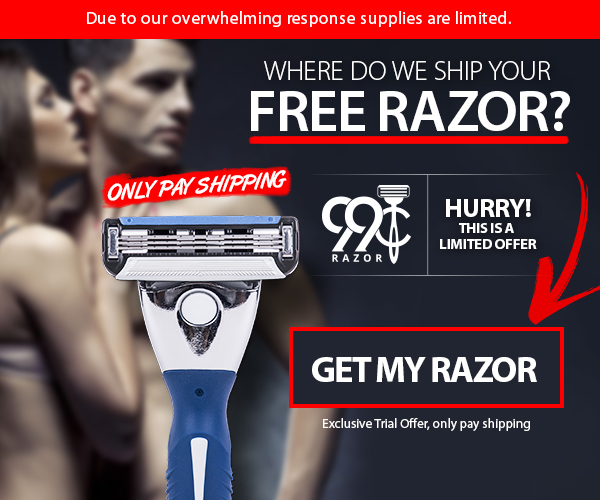 Rating a 3.4 out of 5 stars, it’s an affordable product aimed at improving the quality of your beard. The holding power of this beard balm is on the weaker side, but do you want a product that’s going to dry fast and hard, leaving you with an untouchable, crusty exterior? 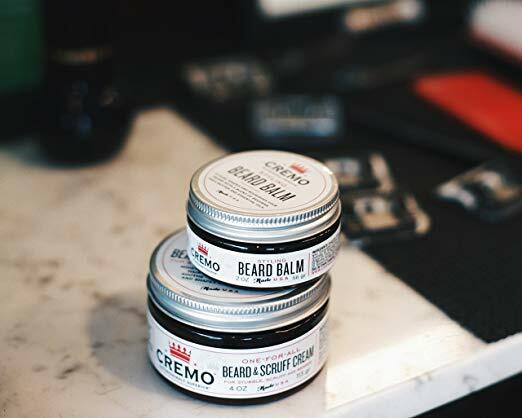 Conditioning and moisturizing while providing a protective barrier is ideal for your beard in the long haul, and Cremo beard balm is the perfect product to achieve those results.